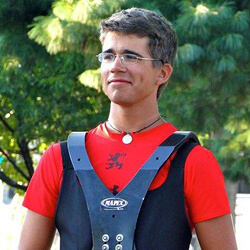 Cary Anderson, 19 Old Dominion University Troopers Snare 2010, Boston Crusaders Snare 2011 What do you think is important in choosing which corps to audition for? People have a plethora of varying reasons when deciding which corps to go for, whether it be proximity from their abode, the corps' ranking or reputation, the color of their uniforms, or if they are Open Class or World Class. For me, it was all about two things: The approach we would take to the drum and the way we would eat over the summer. As far as the first idea, what truly drew me to Boston was the percussion staff change from the 2010 season to the 2011 season. I knew that Ellis Hampton (percussion caption head) was pretty much "king drummer of the universe" (copyright Ralph Hardimon) and knowing all of the fantastic work he had done with Phantom Regiment between the years 2008-2010, my choice was pretty much made for me. I love the way that Ellis and the rest of the staff taught us, always giving new and important information in order to keep the summer fresh and exciting. I am very proud just to tell people that I have had the privilege to study under such amazing instruction. Moving onward to idea number two: The grub. This may seem like a silly choice that may aid in deciding where to march, but I take my food seriously. I had heard many good things about Boston's top-notch summer cuisine, and I must say, those folks were not blowing smoke. The food over the summer was jammin'! We had a group of some of the finest chefs that you have ever seen cooking out of a semi-trailer. Those dudes made a mean pulled pork sandwich. I always made sure to go back for another! How do you like to prepare for an audition? Well besides the stock answer of "I like to practice my instrument quite a bit," when I was auditioning for Boston this past year, I went on YouTube and viewed the snare line's technique and approach to the drum so I could have as much of an upper hand going into the audition as possible. Another EXTREMELY valuable tool that I used frequently was my trusty little handheld camera. I would set up my drum and record myself playing exercises or show music. I would watch the video afterward and find out what sounded good and what sounded straight up nasty. I really swear by making recordings to become a better player. If you think about it, when you are playing by yourself everything you play goes by in real time without the ability to rewind and see if that left tap was really at the right dynamic level. With a recording you can always go back and find something that could be better and that you may not have caught the first few listens through it. What was your experience like the first time you auditioned for a corps? Oh man, I have told this tale many times and every time I do, it hurts a little more, but I guess once more won't kill me! Flashback to November, 2008 in chilly Bloomington, Ind. I was a junior in high school at the time and had only played traditional grip for about three months (my high school played with match grip). I was introduced to DCI by a friend who plays trumpet at Blue Stars, and he asked me if I would like to come up to audition, too. I said "SURE!," without really knowing what I was getting into because at this point, all I knew was what I learned in high school band. When I get to the audition site, I saw all the people trying out for snare (No foolin', there were about 100. ), and immediately started to realize that I was in for one wild ride. So the weekend rolled on and more and more I realized that these dudes were echelons better than I was, so the fantasy of marching around on a football was sadly becoming more and more distant for me, but I didn't let that keep me from learning all I could from the weekend. Skip ahead to the individual audition. I walked into the room and saw two things standing between my destiny and me: a snare drum and a Mr. Tom Aungst (percussion staff member). As soon as I stepped up to the drum, it was like Niagara Falls betwixt my armpits. Mr. Aungst asked me a few questions to try and calm my nerves (to no avail, of course). He asked me to play an exercise called "09 Paradiddles." I took a deep breath, exhaled, and did my best. Unfortunately, I ended up playing the wrong exercise. He stopped me and asked me to restart. Embarrassed, I took another deep breath, exhaled, and tried it again. Just my luck, I played the wrong exercise again. He stared at me with a look of chagrin, and I realized that I had been chopped. He proceeded to tell me that I received a "3" rating and that I should try getting some more experience and possibly try again next year. Just like any other human would be, I was more than disappointed that I had not made the group. But keeping my spirits high on the plus side, I was proud of myself for actually going out to a camp and getting the exposure to the insane amount of skill I would need to acquire in order to march with the elite. I definitely believe that if I had not gone out to that camp then I would not have made the Troopers in 2010. The importance of knowing how much I had to improve in the year between auditions is what really kept me going. What advice would you give to somebody who is nervous or unsure about auditioning? "Decide that you want it more than you are afraid of it." –Bill Cosby. If marching in a drum corps is something that you really desire to do, you won't get any closer to doing it by sitting at home in the La-Z-Boy and downing some Dr. Pepper! Everyone is nervous at an audition camp, no matter if you're 14 or 21 years old, but the more prepared you are for the camp both mentally and physically, then the less the nerves will get to you. You have to go into the audition room and just own it, not with words, but with the vibe that you give off behind your instrument. Approach the weekend with the mindset that you are doing a master class with your instrument and any person who is able to see you play is blessed. Confidence will take you the distance. Any other tips? Don't hack. Learn more about corps audition dates, locations and additional info.